I think I have a photo of that tractor taken in the 1970's, it's not moved since then, but is becoming more picturesque as the brambles take over. beauty and art are in the eye of the beholder , and it is art at its most honest and brutal way. Isn't it strange how if old rubbish is allowed to lie about for long enough, it becomes classed as of Historical Heritage. Pretty sure RET does not apply to commercial vehicles. That tractor is a minuscule part of a working rural landscape. I bet if there was a 10m square sheet of paper with a tiny dot in the corner, its the dot you would describe. Finkety people best go elsewhere. Perhaps if we had this conversation mid summer it might go better for you, but in winter...... 4 boats a week if youre lucky, Muck is often cut off for weeks, not to mention Canna. Beaches kept clean by people that, because there is no "someone ought to do something", do it themselves. I am with you Dougal, wonderful patina on that tractor, surely there are worse things to bother them? To some extent it's a difference in attitude. Crofters are often hoarders. You never know when something might come in handy. So that old rusty gate might be perfect for fixing a hole in a fence. That bit of plastic pipe that came ashore will be useful for a drain someday. And on it goes. It's a different set of priorities, and it's a landscape that exists to serve its own ends, not some tourism-driven image of perfection. As to fish farms... well call me biased because that's the only job I can get locally that pays year round and pays well enough for me to put a roof over my family's heads. It's an industry with many faults and problems but as Scotland's single biggest food export you can't deny its importance to the national economy. I don't see how it's any worse than the oil industry, and it will still be going strong long after all the oil is gone. When salmon cages first started on the West Coast, they tended to be in sheltered bays, and as a result, interfered with lots of good natural anchorages. Experience has taught them that it's not clever to foul their own nests, and as a result, they are now more often offshore, where the run of the tide helps to carry away the sh*t.
Mussel ropes are much more of a problem. Think of Loch Spelve and the Loch Roags. But it cannot be denied that fish farming has brought thousands of jobs and opportunities, to places up and down the coast, which would otherwise be dead. There's more to the Highlands and Islands, than whisky, heather and shortbread. Some of us love it, and most of us respect it. Last edited by NormanS; 06-02-19 at 20:26. Yes it is sad that we as a country cannot have fish farms, wind turbines, large cruise ships, oil and gas industires, we try and mange these sectors for the best of the environment, and I believe we have some of the best in the country, but there are those that think that they want none of this as they want to come to Scotland and sail and have no interference of their view or enjoyment. I have never been put off by fish farms or turbines or large ships , we are all here to share and enjoy, and these industries do not retract form the stunning beauty of Scotland. 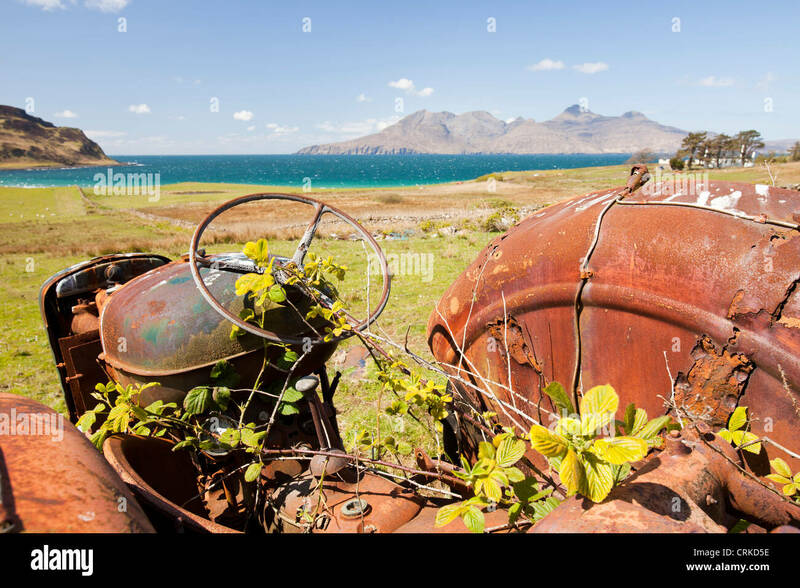 Somewhere I have a picture of a 2CV near Kildonan on Arran, almost completely consumed by a rose bush. It's quite pretty, and - perhaps since I have weakness for old vehicles - I think that tractor is quite pretty too. There is worse scrap around. I bet if there was a 10m square sheet of paper with a tiny dot in the corner, its the dot you would describe.! The effect of something ugly can be out of all proportion to its size. However, I am not talking about the odd abandoned tractor, but about the huge areas of scrap you find in some places. Fionnphort is particularly bad, for some reason. Not that I blame the locals, you understand. There needs to be much better waste and scrap collection. Apart from anything else, steel was going for £100/ton not long ago. They are perfectly entitled to their views, you know, just as they are perfectly entitled to take their money to somewhere they think looks nicer. That said, there undoubtedly a degree of over-the-top moaning about wind turbines. We have lots in Galloway, and there was a very vocal local pressure group against them for every conceivable reason from "the tourists will stay away" to "low frequency noises will trigger our gluten intolerance". Finally they raised enough money for a local referendum to demonstrate the depth of feeling behind their arguments. The locals voted 80:20 in favour of wind farms and the pressure group just faded away. Soon we'll have £300k per year to spend from the farms, which is going to be a hoot, since it's due to be channelled through the community council, which is a small group of pensioners more used to complaining about (a) parking (b) bus timetables and (c) young people.